SAVE Stores is proud to have been given the prestigious Diamond Dealer Award for New Hone/Janome. Janome is widely reguarded in our industry as the durable, "bullet proof" machine. Unlike most brands that need to be stitched in before they work and you can take them home, Janome builds them right the first time. This level of quality control ensures that you will have years of trouble free opperation on your new Janome sewing machine. In fact, Janome offers the industries longest warranty in the industry: 25 years parts, 5 years electronic parts. If you live in the Portland Metro area, you can get an exclusive extended warranty for free on most models that includes labor for all covered parts. That means 25 years parts and labor on ALL covered parts. For a more in-depth article on the early history of the company, visit The International Sewing Machine Collectors' Society and access the piece called “The Men Behind New Home”. At SAVE Stores, JANOME means "Japanese New Home"
Janome has been leading the industry with such innovation ever since. The company now has sewing divisions in the United States, Canada, Mexico, Europe, Australia and New Zealand as well as agents in Africa, Central and South America and throughout the Pacific Rim of Asia. The company's manufacturing prowess has also made it a world-leader in the production of high precision robots. Domo arigato, Mr. Roboto! In 1979, Janome technology introduced the world's first programmable, computer sewing machine - the MEMORY 7. In the mid 80's came the worlds first home embroidery machine. Janome has always been an Industry leader in Technology and Today, our Memory Craft computer models consistently stand out in the industry for their ease of use and precise stitch results. 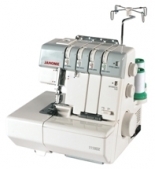 Janome offers European stitch quality at a price your wallet appreciates. A Letter From Toshi Takayasu, President and CEO of Janome America, Inc.
Janome products have been at the cutting edge of sewing technology since the earliest days of our founding. We were the first to develop a computerized machine for home use (the Memory 7, in 1979), the first to offer professional style embroidery to the home market (the Memory Craft 8000, in 1990) and the first to offer a long-arm quilting machine for home use (the Memory Craft 6500P, in 2003). The long-arm quilting machine has also evolved to the third generation with the introduction of the Horizon Memory Craft 7700QCP, which features 11 inches of arm space, AcuFeed dual feed, and a high resolution LCD touch screen with jog dial control. Today, our flagship model, the Horizon Memory Craft 12000, is redefining the way sewists enjoy their hobby. This state of the art machine is equipped with Real-Time PC Connection with Horizon Link™ software. This connects the machine to a PC or laptop, allowing users to create and edit embroidery designs and stitch combinations on a PC or laptop with a mouse, anywhere, anytime. This, in addition to a true 9mm stitch width, Variable Zigzag, the Linear Motion Embroidery System, and many more features make this the most powerful, yet effortless sewing, quilting and embroidery machine available. At Janome America, we want our products to inspire, not intimidate—because the most important function our machines perform is to set free your creativity.